It was a day full of milestones as the EMU basketball women controlled the second half in a 78-63 win over Randolph College Saturday afternoon in Harrisonburg. 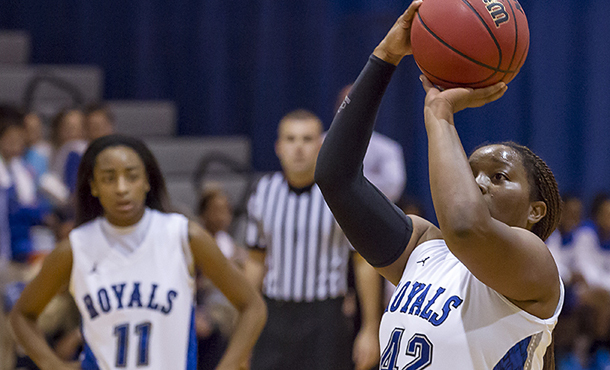 The Royals won their 28th straight game at home as they improved to 11-1 in the ODAC and clinched a top four seed in the ODAC Tournament, which starts the last week of February. With an offensive putback at the 12:41 mark in the second half, senior Shakeerah Sykes (Dumfries, Va./Forest Park) scored her 1000th point, becoming just the 12th EMU woman to break the barrier. High school teammate Alisa Brown (Dumfries, Va./Forest Park) also tied her career high with 10 assists in the win. Eastern Mennonite’s women haven’t lost a basketball game in Yoder Arena since Jan. 7, 2013, in a 54-49 loss to Elizabethtown. Randolph proved to be a handful in the first half, as the visitors connected on their first six field goal attempts and traded leads early. The Royals eventually worked out to a seven point lead at 32-25, but the WildCats had a chance to grab the lead at halftime when they got the ball after an EMU turnover with the shot clock turned off. Brown picked out a key steal with 10 seconds left before she eventually assisted Jess Rheinheimer (Manheim, Pa./Lancaster Mennonite) on a buzzer-beater on an inbounds play, giving the Royals a slight 39-36 cushion at the break. Despite entering the game with a 38% shooting clip, Randolph shot a lights out 56% in the first 20 minutes, including 5-for-6 from long range, to put a scare into EMU. The Royals took off in the second. Holding a 44-40 lead with 17 minutes to play, the women clamped on the defense which got their transition game going. EMU scored 13 unanswered points to blow open a 57-40 edge, capped by a Sykes layup with 14:16 left. A minute and a half later Sykes got her big bucket to crack 1000 points and the women cruised. Randolph would get no closer than 11 points the rest of the way to the 78-63 final score. Eastern Mennonite stifled their guests in the second half to just 30% shooting. For the game, the Royals finished with a 48% to 41% shooting advantage. The women also hit on 10-of-21 attempts from three point range. Rheinheimer scored a game high 27 points as she was 5-for-6 from outside. She also had six rebounds. Sykes had yet another double double with 18 points, 11 rebounds and five steals. She has scored 1004 points in her career. Sa’Mone Moore (Covington, Va./Covington) was good for 12 points and six boards. Brown had three steals to go with her 10 assists. Taylor Samuels hit four triples to lead Randolph with 18 points. Jensen Hoover finished with 10 points and nine rebounds. Eastern Mennonite takes a 17-3 record into next Wednesday’s ODAC date at Shenandoah University. Start time in Winchester is at 6:00pm.